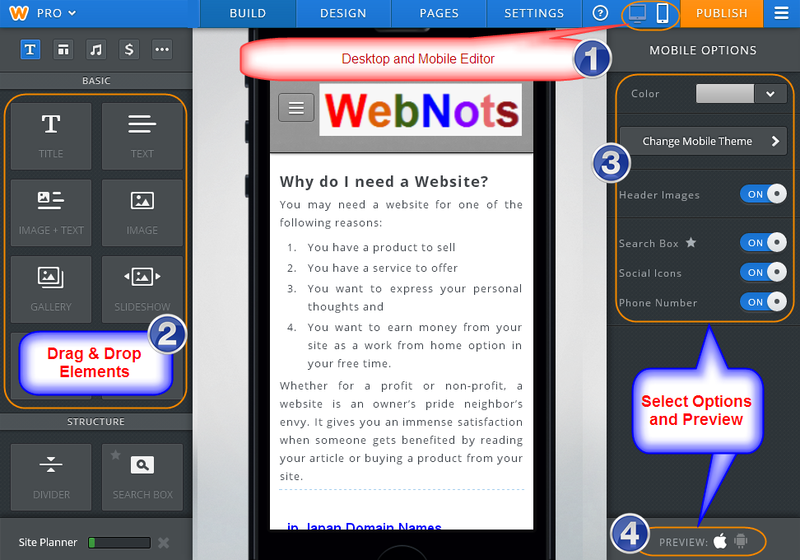 Home » Website Building » Weebly » How to Create a Free Weebly Mobile Site? How to Create a Free Weebly Mobile Site? Desktop and Mobile editors are in the same screen helps webmasters to check the mobile page view quickly. Auto sync between desktop and mobile sites. Powerful drag and drop elements. Preview of iPhone and Android. Simple Customization options for Header and Themes. Mobile editor can be accessed by clicking on the phone icon in the Weebly desktop site editor as shown in the point 1 of the below picture. All the elements can be dragged and dropped to your mobile site similar to the desktop site and switching between the editors is simple by just clicking on the desktop and mobile icon. This makes very convenient for the webmasters to ensure the supported elements are used in both the versions of their site. Changing the color of the mobile theme. Switching off the header images if it is not fitting into the mobile screen. Enable or disable Search box, Social Icons and Phone Number fields. Menus are auto arranged to suit the mobile view. Pro features like Site Search Box are highlighted with star mark. You can directly enable or disable the elements in the editor also. Weebly currently offers very few mobile themes. 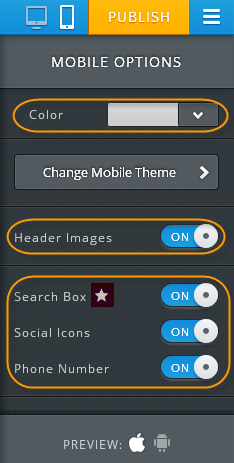 Click on the “Change Mobile Theme” to see the list of themes available. Clicking on the theme will show you the option to change the color if available. 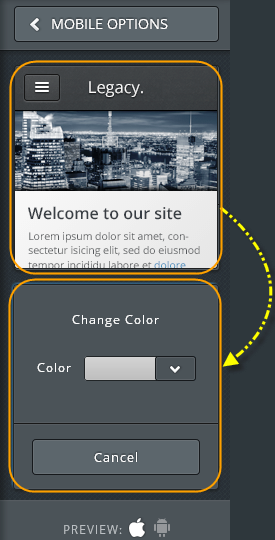 Select the theme and color and the editor will automatically adjust your site as per the theme you selected. You can change the mobile editor to iPhone or Android view. 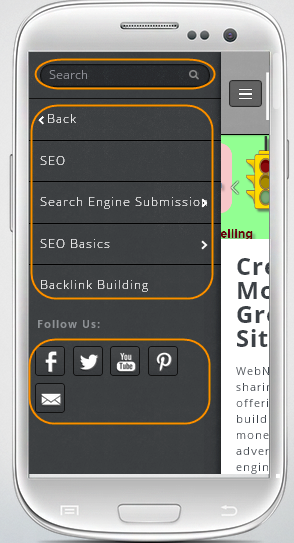 Adjust the elements not fitting to the mobile view and publish your mobile site. Setting a mobile redirect is a simple click in Weebly and you do not need to insert any HTML codes in your desktop site. Go to “Settings” tab and enable the check box under the “Mobile” section, this will auto redirect the mobile visitors to your mobile site. Weebly mobile editor does not offer access to edit or view HTML/CSS. This means you can only choose the available features from the editor and can’t customize your mobile site view. 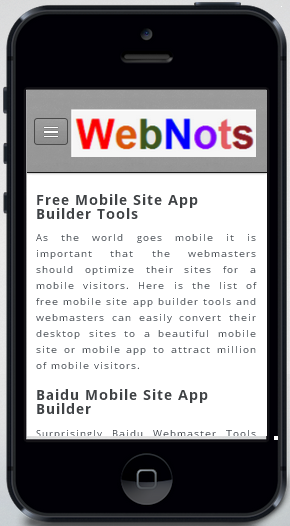 For example you can’t remove the free Weebly mobile footer from your mobile site.